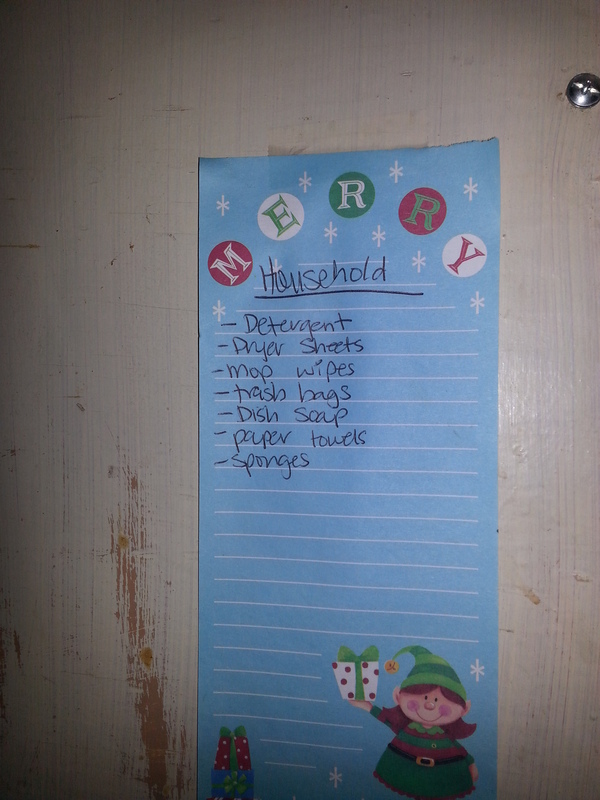 MSfit Momma makes a Ta Da List! Hello and Welcome to MSfit Momma! I’m a momma with Multiple Sclerosis (MS). I am Married and have a 5 and 3-1/2 year old. I have been diagnosed with MS for about 2-1/2 years now. Since my life suddenly changed, I have been forced to figure out new ways of doing things. I have issues walking and thinking. In the Summer, I often have to use a mobility device because my left leg goes on strike and doesn’t work. I have had to find ways to stretch our pennies, stretch our food and stretch my sanity. That last one is part of where this blog comes in. I need more Adult interaction. It’s hard to be with my kids 24/7. I love that I am home with them but sometimes I just want to talk about adult topics. I have never been a List Maker. Writing out Lists panics me. The thought of writing things out is so overwhelming. What if you forget to put something on the list?? It was never an issue before MS because I could just remember things…Birthdays, groceries, things that needed to be done, phone calls that needed to be made. It was never a problem. Now it’s a huge problem because my brain plays tricks on me. Just thinking about something, sometimes gets translated to that I took care of it and I don’t know the difference until it comes up later (often in the form of a Past Due Notice). I just want to share some ideas I’ve come up with that have helped me become more organized. Hopefully a tip here and there will help you too! 1) If the thought of WRITING things down overwhelms you enlist help. 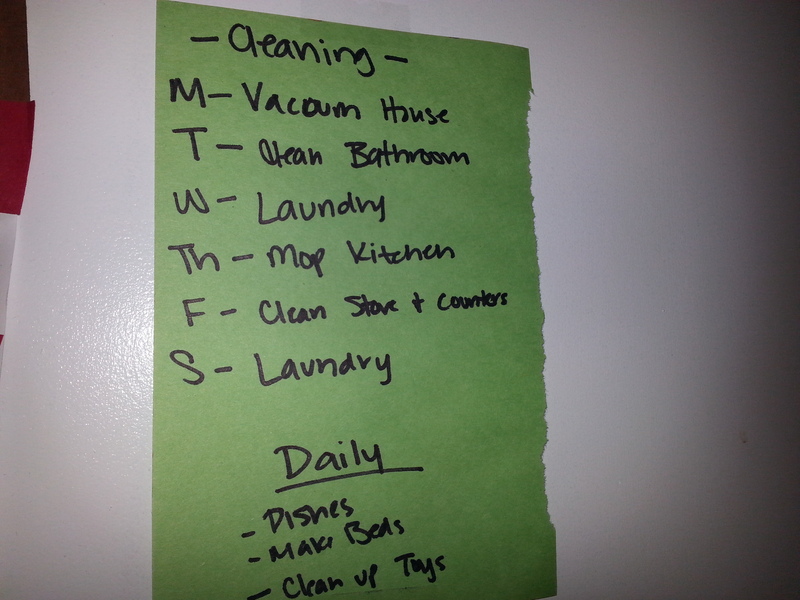 My husband writes out most of our lists for me. We have Family Planning Meetings about once a week. We have a conversation after the kids are asleep and he writes down the main things that need to get done that week. (Birthday gift for Grandma, getting our son to his class because I have a doctors appt, etc.) I also have been known to call my best friends or sister to write lists for me over the phone. 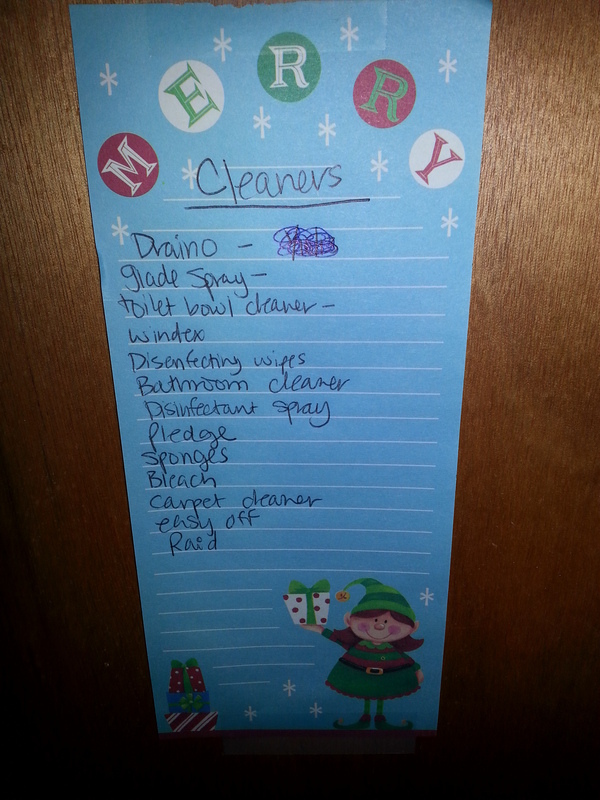 3) When we first moved in to the house we live in now, I had my husband scribble out cleaning supplies for each area of the house (Bathroom, Kitchen and Laundry Area) I also read this list to jog my memory before going shopping to make sure we don’t miss something we forgot to add to the lists. 4) If all else fails, TEXT something you suddenly remember to someone. I send texts all the time to my BFF or Mom that say odd things like, “String Cheese”, followed immediately by a second text that read “Ignore that”. There have been many apps suggested to me by friends to help write lists but none have really worked. If I text it, I can reference it later since I sent it. 5) Keep a calendar. We have a calendar in our bedroom, one in the Man Cave and one I carry in my purse. I update them all on the first of the month with whatever has been scheduled that month already. We have busy schedules and something is bound to slip through the cracks but automatically updating on the first works for us. The calendar in the Man Cave is also helpful to my husband. He can look at what our week or month looks like. Sometimes I forget to tell him I scheduled something or sometimes it doesn’t occur to me to tell him about something. This helps us communicate without having a conversation sometimes. If something gets added, I go around and update all 3 calendars at once. See I made a Ta Da!! list of 6 things you can try to do in your house to help you keep your house running slightly smoother! What are somethings that you do around your house to keep it more organized? I struggle with the same things, lists are me new best friends!